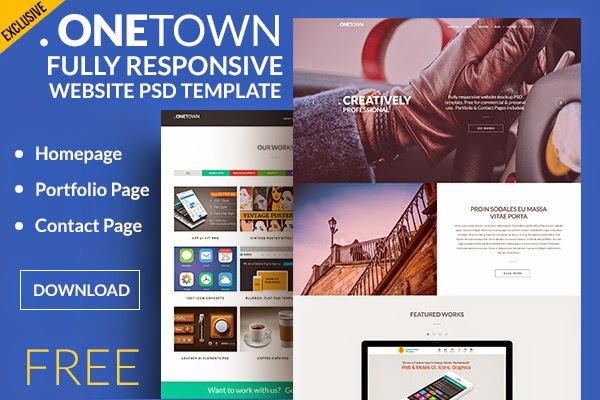 Today, we would like to thank our readers with a pack of free website PSD templates called .OneTown. The website template is created based on the responsive design trend. This is a exclusive freebie that comes in 3 PSD files: Homepage, Portfolio Page (includes image popup) and Contact Page. The page designs are sleek and beautiful and you can use the layouts to create your agency, business or portfolio website design. The template is based on a 1920 pixels canvas. All the templates are fully layered and every element in the PSD file is organized in named folders to ease editing work. You can modify the templates based on your design needs and get them coded as a responsive website! You can use the .OneTown templates free for your personal or client work. Image courtesy: The free images used in the design work is from PicJumbo.com by Viktor. Thank you and keep up the good work, man! !